SCVHistory.com LW3165 | City of Santa Clarita | Councilman Dennis Koontz with Wicks' 'Wiley Canyon Bridge' Cartoon, 12-15-2017. December 15, 2017 — As the city of Santa Clarita celebrates its 30th birthday with a public reception at City Hall, Founding Councilman Dennis Koontz (1987-1990) holds an original editorial cartoon by Signal artist Randy Wicks showing Koontz and his council cohorts — then-mayor Jan Heidt, Buck McKeon, Jo Anne Darcy and Carl Boyer — forming a human chain between the dead-end of Wiley Canyon Road and the Circle J subdivision. At issue was the future Wiley Canyon Bridge, which would span Railroad Avenue (then called San Fernando Road) and the South Fork of the Santa Clara River. The City Council unanimously approved the construction project May 23, 1989, when the city was about a year and a half old. 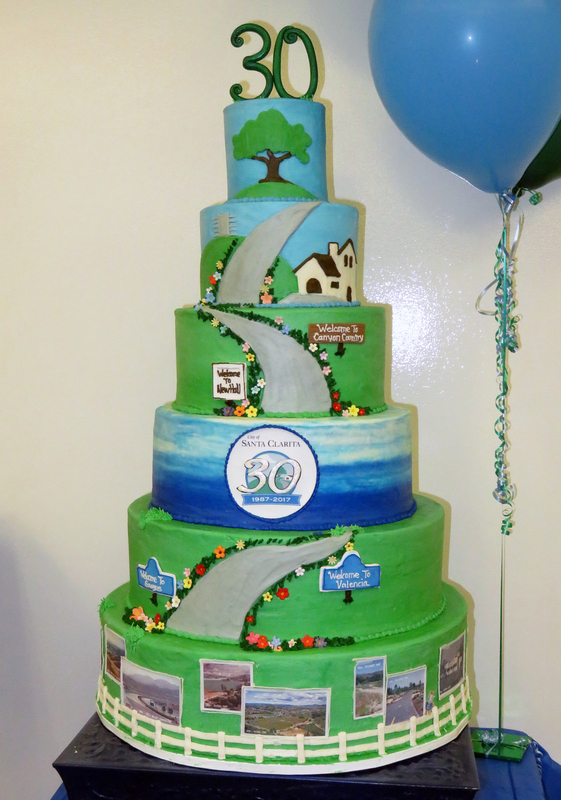 "It was the first bridge we built," Koontz recalled nearly three decades later. Taken for granted today, the bridge wasn't without its controversy, like many of the issues the early City Councils dealt with. Residents in the brand-new Circle J community demanded the "escape route" they believed their Mello-Roos fees were paying for (approved by L.A. County, Circle J started construction around 1982 and was still being built in 1989) — while many Valencia residents were dead-set against. The bridge battle, perhaps the most divisive issue in the city's short history, has pitted two neighborhoods against each other and placed the City Council squarely in the middle. Residents of the 600-home Circle J Ranch housing development say the bridge is needed to provide them with a vital second access out of their tract. Valencia residents say the bridge would dump an unfair load of traffic onto Wiley Canyon Road, eroding the quality of life in their neighborhoods. After much debate and alternate motions, the council approved a motion by McKeon, seconded by Koontz, that called for a package of road improvements that included bridge construction — but not before San Fernando Road and Wiley Canyon Road between Lyons and Calgrove were widened to ease the traffic flow. Randy Wicks arrived in Santa Clarita from his hometown of Belmond, Iowa, in 1976. His passion for artistic expression in journalism drew him to California Institute of the Arts, where he graduated in 1980. He was originally hired by Scott and Ruth Newhall and served for 16 years as The Signal's editorial cartoonist. Wicks' cartoons were also nationally syndicated. He received 19 national and regional awards during his career. 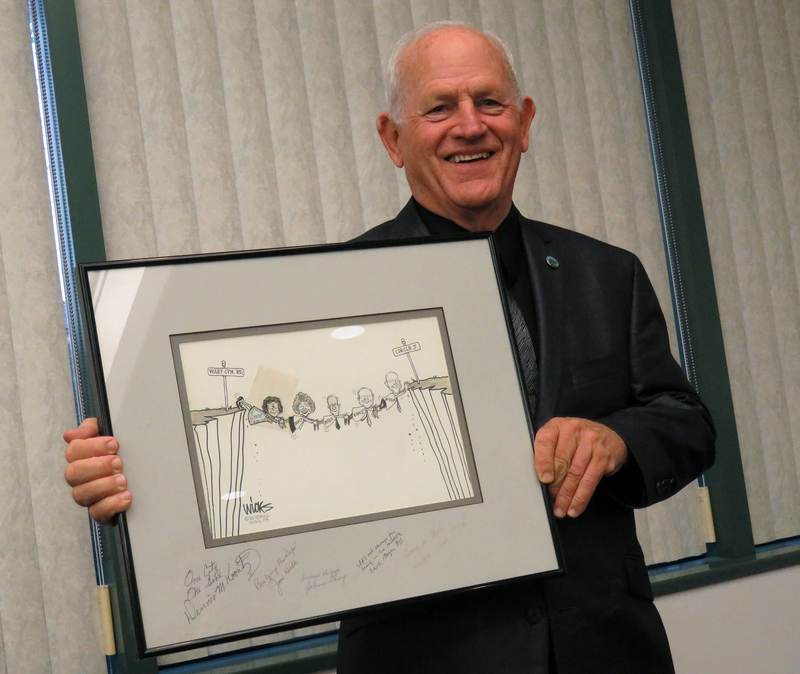 Randy's illustrations reflect how deeply he cared for life, fellow humans and our community. He valued libraries and education, donating his talents and time to local schools and charitable organizations. 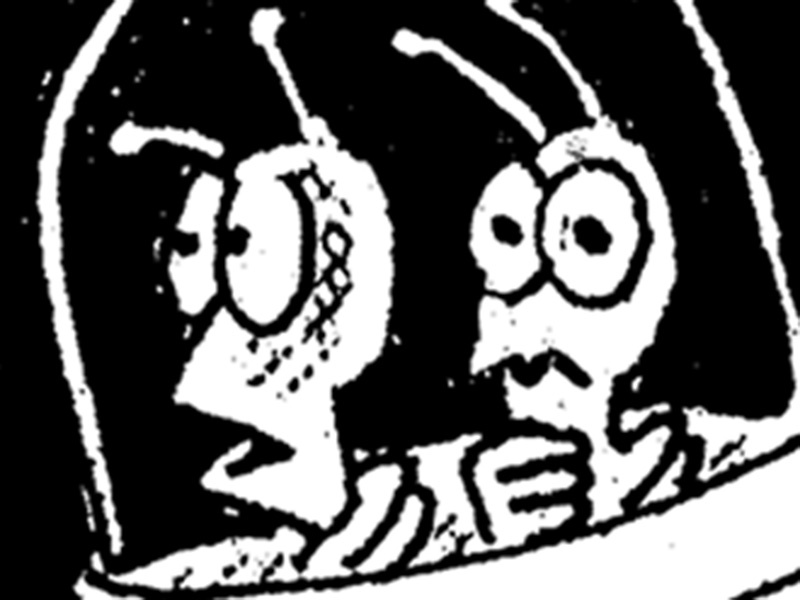 The thousands of original drawings that constitute the Randy Wicks Cartoon Collection are owned and controlled by the Wicks family (The Signal had "first publication" rights) and are administered by Kiza Hilton, who provided a first-generation copy of the collection for display on SCVHistory.com. LW3165: 9600 dpi jpeg from digital image(s) by Leon Worden. 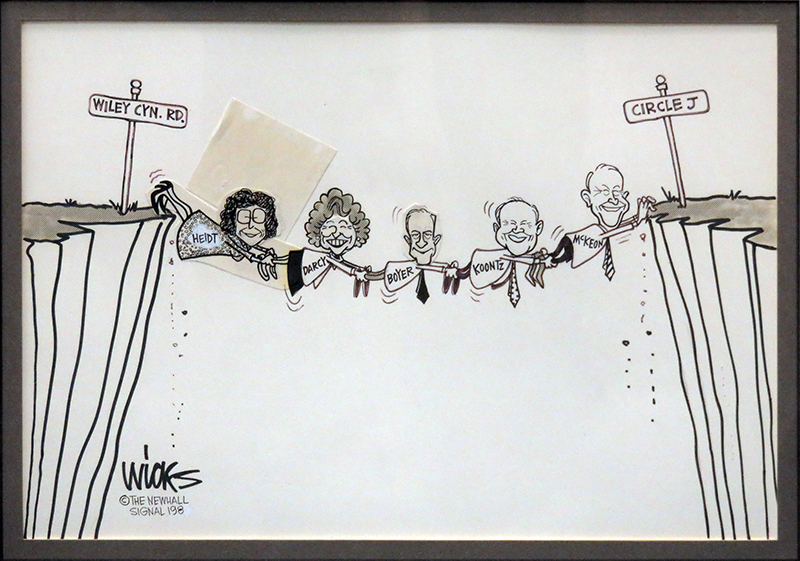 Original Wicks cartoon in the City of Santa Clarita Collection. Matted and signed by the five council members.